From the Top is thrilled to announce the two recipients of the 2019 From the Top Alumni Leadership Grant, 19-year-old pianist Amir Siraj and 20-year-old pianist Eunice Lee! The Alumni Leadership Grant, generously funded by the Howard and Geraldine Polinger Family Foundation, seeks to support alumni of From the Top’s media and arts leadership programs who have created projects using music and the arts to impact their local communities. Troubled by the future of America’s National Parks and Monuments – and its natural landscape in general – Amir Siraj aims to use music to draw attention to the urgent need for environmental preservation in the United States. When designing his service project, Amir noted the power of arts advocacy to raise awareness around neglected issues. Namely, he was inspired by “Elegy for the Arctic,” Ludovico Einaudi’s Greenpeace-affiliated musical and visual depiction of the effects of climate change in the Arctic. Amir argues that the combination of music with a natural setting can stir a deep emotional response in those who experience it and hopes that this emotional response will renew his audience’s conviction to fight climate change. Using “Elegy for the Arctic” as a model for environmental arts advocacy, he will present two concerts at different National Monuments, with the goal of inspiring the American public to stand up for protected lands. Musically, he plans to collaborate with From the Top alumni composers to communicate the value of federally protected lands and the urgency with which we must act to defend them. 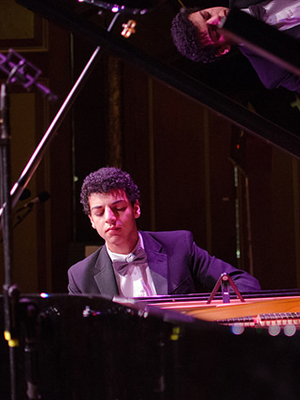 Nineteen-year-old American pianist Amir Siraj is a 2017 U.S. Presidential Scholar in the Arts, a Steinway Young Artist, and a Lang Lang International Music Foundation Young Scholar Alumnus. Siraj performed at the GRAMMY Salute to Classical Music at Carnegie Hall in January 2018 and made his Boston Symphony Orchestra debut in March 2018 and his Wigmore Hall debut in May 2018. He has been guest soloist with orchestras including the Boston Pops Orchestra, New England Philharmonic, Quincy Symphony Orchestra, Metrowest Symphony Orchestra, and Midwest Young Artists Symphony Orchestra. He received the Grand Prize at the Fidelity Investments Young Artist Competition, First Prize at the Harvard Musical Association, and Second Prize at the Kaufman International Youth Piano Competition. Siraj has also appeared on NPR’s From the Top Show 334 selected as a winner of the National YoungArts Competition. In addition, he has performed for luminaries such as His Excellency Moon Jae-In, president of South Korea, and The Right Honourable Justin P. J. Trudeau, Prime Minister of Canada. The Alumni Leadership Grant will enable 20-year-old Eunice Lee to continue a project she began in July 2018, when she organized and directed a 10-hour music marathon in Austin, Texas. This music marathon was a charity event dedicated to supporting the nonprofit Together We Rise, which focused on the reunification of separated foster siblings. Within just 15 days, over 100 performers and volunteers from all over the state of Texas raised almost $2,000 for the cause. This year, Eunice hopes that funding from the Alumni Leadership Grant will allow her to expand the marathon’s impact, both musically and philanthropically. Now expanded to 24 hours and re-named The Meridiem Music Marathon, this year the project will raise money for the children’s charity, Variety of Texas, featuring musicians of all ages, instruments, and genres. In addition to raising money for a charitable cause, Eunice aims for the marathon to be a musically enriching experience for participants as well. She wants to engage a wide audience that includes affiliates of Variety of Texas, as well as the event’s performers, their families, and friends. A wide range of music will be presented by a diverse range of instrumentalists of all ages. Ideally, this group will come away from the marathon with a new network of musical collaborators and a shared passion for community engagement. 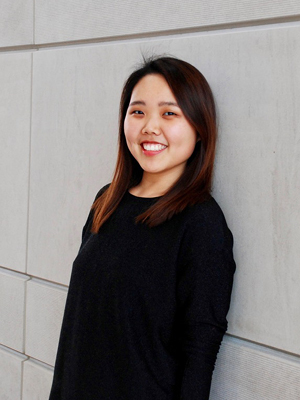 Originally from Austin, Texas, Eunice Lee is a sophomore at Northwestern University double majoring in Learning and Organizational Change and Piano Performance, with a minor in Business Institutions and a certificate in Integrated Marketing. She began playing the piano at age seven with Shearon Horton and currently studies with Dr. Sylvia Wang. Lee won many competitions and was awarded full scholarships to festivals, such as the Texas State International Piano Festival, New Orleans Piano Institute, TMTA State Performance Competition, Baylor/Waco Piano Competition, and many more. In 2013, Lee appeared on NPR’s From the Top Show 274, thus catalyzing her interest in empowering other musicians to use their talents for a positive impact. She loves to fuse aspects of music and business to support greater missions like fine arts education, programs for socio-economically disadvantaged children, natural disaster relief, and foster care. As a result, Lee has taken the initiative to organize many projects to reunite communities through the power of music. A few examples of her projects include Music Eunited and the Meridiem Music Marathon.